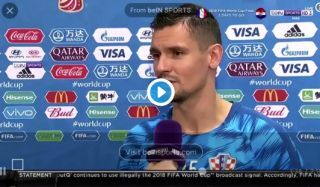 Dejan Lovren has really bigged himself up in this video interview below, declaring himself as one of the best defenders in the world. The Croatia international has, in fairness, had a strong season for club and country, but didn’t he just take this opportunity to remind everyone. Discussing his achievements, Lovren seemed to relish the opportunity of hitting back at his critics, of whom there have been many during his time at Anfield. Still, Lovren has improved recently and he reminded everyone that he’s now helped Liverpool to a Champions League final and Croatia to their first ever World Cup final in the same year. ‘I took Liverpool to the final of the Champions League and now Croatia to the World Cup Final. I think people should recognise that I am one of the best defenders in the world,’ he said. While Lovren has every right to be bullish, he should remember that football is an unforgiving place and he is just about to come up against an in-form Kylian Mbappe as well as big names like Antoine Griezmann for France this weekend. Those two could end up humiliating him if he doesn’t have his best game, and fans will no doubt be digging this video up again soon if he is at fault in the World Cup final.